Chia sprouts are used in a similar manner as alfalfa sprouts in salads, sandwiches and other dishes. Chia sprouts are sometimes grown on porous clay figurines which has led to the popular U.S. cultural icon of the Chia Pet.Chia seed may be eaten raw as a whole seed and is an excellent source of omega-3 and dietary fiber (both insoluble and soluble). Ground chia seed is sometimes added to pinole, a coarse flour made from toasted maize kernels. Chia seeds placed in water or fruit juice is consumed in Mexico and known as chia fresca. The soaked seeds are gelatinous in texture and are used in gruels, porridges and puddings. Ground chia seed is used in baked goods including breads, cakes and biscuits. Chia is Nature's Complete Superfood. Chia is the highest plant based source of Omega 3, dietary fiber and protein. Chia is a great tasting seed that is easy to include in the daily diet for improved health. 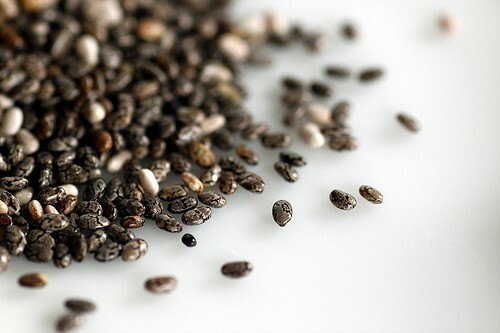 Chia seeds were first used as food as early as 3500 BC and were one of the main dietary components of the Aztecs and the Mayans. •Chia Seeds are 100% natural and raw. •Chia Seeds are an effective aid to healthy weight loss. The fiber rich chia seeds and slowly metabolized carbs can help to curb the appetite and has been shown to help lose weight when included with a balanced and healthy diet.